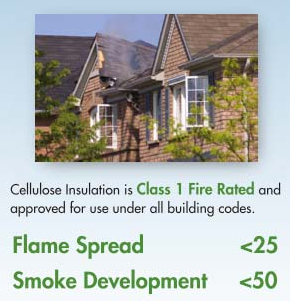 Cellulose insulation is designed to save homeowners money by making their homes more energy efficient. It also has a Class 1 fire rating and is designed to save their homes in a fire by slowing the spread of flames. By design, cellulose insulation likely slowed the spread of flames allowing more time for the fire to be extinguished. Often, firefighters unfamiliar with the product, do not remove the cellulose insulation in the area of the fire where it will continue to smolder, again by design to minimize the flame spread. We applaud the Ashland fire department for their work in this case allowing residents to return to the home after just a few hours. The cause of the fire was wiring to a kitchen light, which is a common problem in older homes where recessed lighting surrounded by improperly installed insulation can lead to fires. An often overlooked benefit of LED or CFL lamps is that they eliminate the danger of attic fires caused by overheating recessed light fixtures – even non-IC fixtures. Homeowners with any blown-in attic insulation product should consider replacing incandescent bulbs in recessed ceiling light fixtures. Add to that the energy saving and environmental benefits of going with LED or CLF bulbs and it makes sense to change from incandescent lighting. See the Fire Test videos on CIMA’s YouTube Channel to learn more about how insulation products perform in simulated building fires. This entry was posted in Building Insulation Fire, DIY & Insulation Tips. Bookmark the permalink.